"How long the stability lasts is anyone's guess," said one economist. World stocks nudged higher on Tuesday, as focus turned to earnings season and a rebound in Italian assets helped battered equities find firmer ground for now. In Europe, shares pulled back from Monday's 22-month lows. 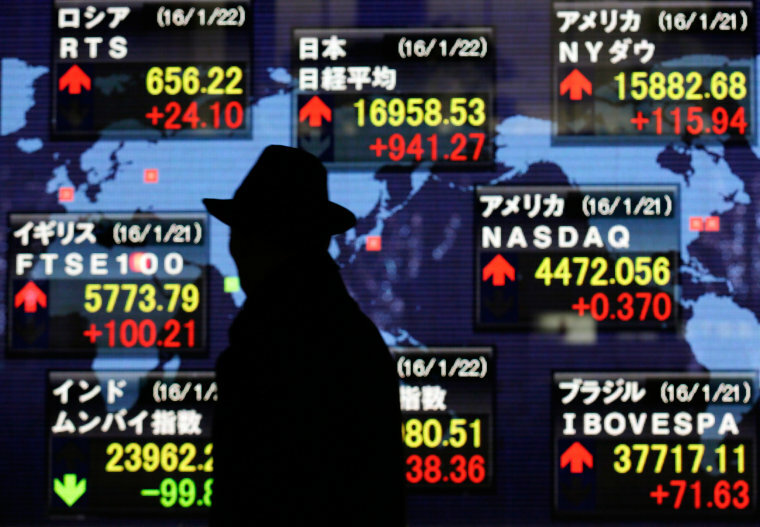 That followed gains in some Asian markets, led by Japan's blue-chip Nikkei index, which was up over 1 percent after a decline of nearly 2 percent the previous day. Gains in Italy's bond and stock markets after Italian Economy Minister Giovanni Tria defended the country's expansionary budget helped lift sentiment. The euro also firmed. Calm in Italy — a major source of turbulence in world markets in recent weeks — helped explain the recovery in risk appetite on Tuesday, said Marchel Alexandrovich, European financial economist at Jefferies in London. Stock market sentiment in Europe also got a boost from expectations that earnings season will deliver double-digit earnings growth for the third quarter. "If you look at what's happening here and now, it is an improvement from what was happening a week ago," Alexandrovich said. "How long the stability lasts is anyone's guess." Japan's yen was down a third of a percent against the dollar, the Swiss franc edged away from almost two-week highs against the greenback and gold dropped from Monday's 2 1/2-month high as tension between the West and Saudi Arabia triggered a fresh exit out of risk assets. The disappearance in Turkey earlier this month of a Saudi journalist critical of Riyadh has provoked an international outcry against the oil-rich kingdom. That backdrop, together with nagging concerns about the economic outlook, global trade tensions and higher U.S. interest rates, meant a degree of caution prevailed. The blue-chip Dow has lost 4.5 percent this month, as long-term Treasury yields soared to their highest level since 2011. Higher yields make equities less attractive. Chinese stocks closed lower on Tuesday after data showed factory-gate inflation had cooled for a third straight month in September amid weaker domestic demand, reflecting more pressure on the world's second-biggest economy.